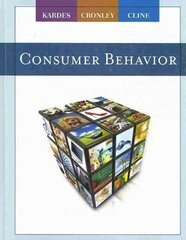 Consumer Behavior 2 Edition This wide-ranging yet focused text provides an informative introduction to consumer behavior supported by in-depth, scientifically grounded coverage of key principles and applications. CONSUMER BEHAVIOR, Second Edition, devotes ample attention to "classic" consumer behavior topics, including consumer information processing, consumer decision making, persuasion, social media and the role of culture and society on consumer behavior. In addition, this innovative text explores important current topics and trends relevant to modern consumer behavior, such as international and ethical perspectives, an examination of contemporary media, and a discussion of online tactics and branding strategies. This versatile text strikes an ideal balance among theoretical concepts, cutting-edge research findings, and applied real-world examples that illustrate how successful businesses apply consumer behavior to develop better products and services, market them more effectively, and achieve a sustainable competitive advantage. With its strong consumer-focused, strategy-oriented approach, CONSUMER BEHAVIOR, Second Edition, will serve you well in the classroom and help you develop the knowledge and skills to succeed in the dynamic world of modern business.